Brothersoft, in cooperation with Kingsoft Software are organizing a giveaway for Kingsoft Office Standard Edition. The Kingsoft Office Suite consists of three programs: Kingsoft Writer, Kingsoft Presentation and Kingsoft spreadsheets. It also has many useful functions like a built-in PDF converter, built-in templates, spell-check and other features. Open, view and edit Word (97/2000/2003/2007/2010) .doc, .docx, .wps and .wpt formats; output to (97/2000/2003) .doc, .wps and .wpt format. Open and view Excel (97/2000/2003/2007/2010) .xls, .xlsx, .et and .ett formats; edit and save (97/2000/2003) .xls, .et and .ett format. Open and view PowerPoint (97/2000/2003/2007/2010) .ppt, .pptx, .dps and .dpt formats; edit and save (97/2000/2003) .ppt, .dps and .dpt format. 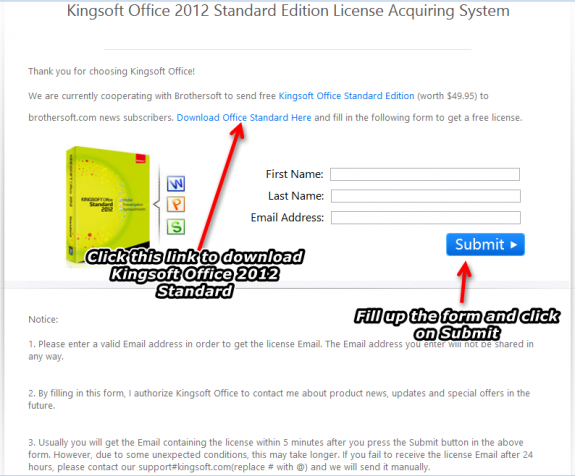 Here is how you can get a free license for Kingsoft Office Standard Edition. Fill up the form to get the license code. Download Office Standard from the link at the promo page or from the product page. Run the installer and it will prompt you to input your license code. Copy it from the email which you got and paste it in the text field and proceed with the installation. Open one of the Kingsoft editors (Writer,Presentation or Spreadsheets) and click on the Help Menu > Product Management Center to check if it has been registered. I tested it on Windows 8 Pro 32 bit and it works fine. Thanks MrGiang for the tip.